Tastefully Simple is the original “Home Taste Testing” party plan company that has offered easy to prepare dips and desserts using only two ingredients or less. This year we are celebrating our 20th birthday and while keeping with our easy to prepare products, we are taking it up a notch and we are becoming your Dinnertime Solutions Company. We offer three delicious freezer meal collections. They include 5-6 seasonings and/or sauces, full color recipe cards with detailed instructions. Freezer meals are an amazing solution for the busy mom! Most families do not know what is for dinner by 4:00pm. This is why we make so many trips through the drive thru or eating out in restaurants. Imagine spending $2-$3 per serving on dinner that, you cook at home with natural ingredients that you can adjust to fit your family’s eating preferences. Keeping with the theme of simple, we also offer collections of products that make entertaining simple. We have a Springtime Celebrations collection that includes 11 delicious products that will brighten any springtime celebration including menus and party tools for Baby and Bridal showers. 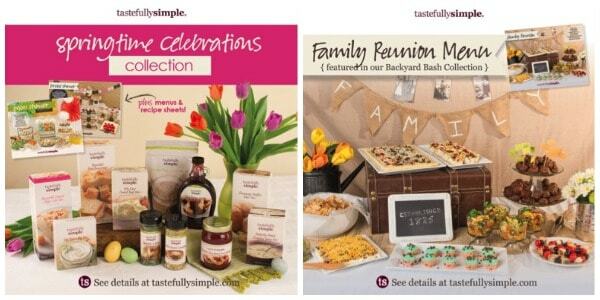 We also have a Backyard Bash Collection that includes 10 delicious products, menus and party tools for the family reunion, a patriotic picnic or even a neighborhood grilling night. 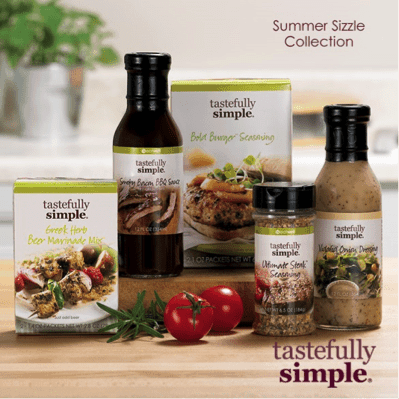 This year, Tastefully Simple has introduced a new line of products full of simple, wholesome ingredients. TS EatWell, makes it easy for every mom to provide balanced choices for the family. These products are free of artificial preservatives, colors, flavors and sweeteners, free of hydrogenated fats and MSG. Everything in this line is made of natural ingredients and we offer 40 products that fit into this category! Tastefully Simple currently has a business opportunity pack to accommodate the career style that fits you best. If you are a party girl and want to party your way to an income, our Business Blast Off kit is perfect for you. Maybe you only want to share the products with family and friends, but no do physical parties; we have an Earn Product pack for you. Or maybe you just love the product and would like to buy at a discount; we have you covered there with our Play Product Pack.